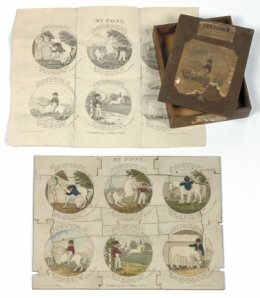 The oldest toy in the sale and, in fact, one of the oldest ever seen at the saleroom, was a Georgian Dissected Puzzle dating from 1812 – a forerunner of today’s jigsaw puzzle – which sold for £420, more than double it’s lowest estimate. Amazingly still complete after almost 200 years, the puzzle was entitled ‘My Pony’ and its mahogany box was inscribed showing that it had been given to a young boy by his governess. Other highlights were seen in the ever popular Diecast Vehicles section - lot 230, a collection of 21 early boxed Matchbox vehicles, sold for £700 (estimate £300-£500), lot 235, a boxed Corgi car transporter and six cars gift set sold for £440 (estimate £200-£300) and lot 270, an American cast iron Yellow Cab sold for £340 (estimate £100-£200). In the Comics and Annuals section, lot 179 included 12 Eagle annuals and a large collection of Eagle comics from 1955 to 1969 which sold for £500 (estimate £200-£300), lot 180 was The Magic Beano Book 1948 and being in very good condition it doubled its highest estimate and sold for £300. Lots 182 and 183 were early Rupert annuals from 1937 and 1938 and sold well for £200 and £160 respectively. 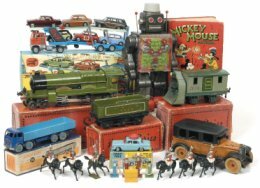 Other very popular toys were the model trains, which consistently sold for good prices and also plastic figures including the Starwars action figures which all sold over their estimates. Today, plastic toy figures are proving more popular at auction than the old lead figures, as collectors prefer toys that they remember from childhood.